One in a series of player profiles from ASA/USA Softball. Click here to view the complete/official player profile. What it means to represent the United States: It’s an honor to represent the greatest country there is and a blessing to be able to represent it through sport. How did you get your start: My dad played when I was a kid and I would tag along. I played my first game when I was 12 filling in for a team who didn’t have enough to play. Who are your role models:Jason Porto. It’s astonishing how much that guy knows about the game. Who is your biggest supporter: My family. Starting with my grandparents. Click here to view the complete/official player profile for Kevin Castillo. For more at Fastpitch West on Kevin Castillo, click here. 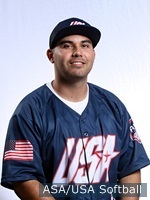 The USA Men’s National team will be competing this summer in the 2015 WBSC World Championships at Saskatoon, SK, June 24-July 5, 2015, and in the Pan-Am Games at Toronto, July 12-18, 2015. Founded in 1933, the Amateur Softball Association (ASA)/USA Softball is the National Governing Body Softball in the United States and a member of the United States Olympic Committee. One of the nation’s largest sports organizations, ASA/USA Softball sanctions competition in every state through a network of 74 local associations and has grown from a few hundred teams in the early days to over 165,000 teams today, representing a membership of more than 2.5 million. ASA/USA is responsible for training, equipping and promoting the six USA Softball National Teams that compete in international and domestic competitions. For more information about ASA/USA Softball, please visit http://www.asausasoftball.com/.